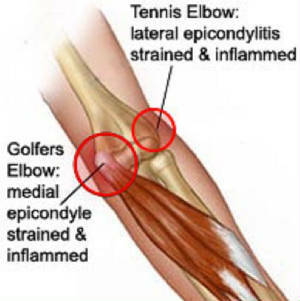 Elbow tendonitis or some of it’s more common names “tennis elbow” , “golfer’s elbow”, or “construction elbow” is a deliberating condition that affects hundreds of thousands of people each year. While on average 25-30 percent of tennis or racquet sport players are affected by tennis elbow, it should be noted that “tennis elbow” is not limited to lovers of the racquet sports. From a sports perspective tennis players, golfers, baseball players, basketball players, boxers, swimmers, and quite a few other sports can all develop “tennis elbow”. From and everyday perspective any type of repetitive stress and strain can lead to the development of “tennis elbow” or some form of it..
What exactly is elbow tendonitis? The elbow joint is a hinge joint that allows for flexion (bending) and extension (straightening) movements. Elbow tendonitis can occur as a result of injury, repetitive use, or due to aging as tendons loses elasticity. Generally tendonitis occurs because the extensor tendons of the forearms get over used. This overuse causes micro traumas to the outside bony area where the muscle and tendons of the forearm attach to the elbow. This in turn causes inflammation and pain in that area. While pain and inflammation in the area can be quite problematic, the bigger problem is tennis elbow is thought to be a degenerative problem of repetitive use. Without getting to medical term heavy on you, this area is called the lateral epicondyle. The actual doctor’s term for tennis elbow would be lateral epicondylitis. When the same process happens to the inside of the elbow it is called medial epicondylitis for the medial epicondyle. Sometimes this same type of injury can also happen to the back of the elbow, resulting in what is called posterior epicondylitis (although this seems to involve the tricep muscles and tendons more than the forearms). Now that we have some insight on what elbow tendonitis is, let’s look at some measures that can take to rehab elbow tendonitis. Two of the best ways to help with elbow tendonitis are thru stretching and muscle development of the muscles of the wrist,lower biceps, and forearms. Stretching is important because stretching relaxes the tendon and loosens the muscles of the arm. The amount of stretching you do will be limited by the amount of inflammation you may have and actual muscle tightness. As these two things decrease you should try to increase the range and time of your stretching. Here are a few helpful stretches for elbow tendonitis. Each stretch should be held for 20 to 30 seconds with a rep of five to 10 times, twice a day. This stretch will stretch out the Lateral Epicondylitis (the muscles on the outside of the forearm and elbow). This will help to work out and relax these muscles and tendons. This stretch involves having the hand open or closed and stretching the palm down towards the forearm. The stretch can be deepened with overpressure from the opposite hand. This stretch focuses on the Medial Epicondylitis (the muscles on the inside of the forearm and elbow). Perform the stretch by pulling the back of the hand or stretching it towards the top of the arm. A gentle pull or stretch should be felt on the inside of the forearm. 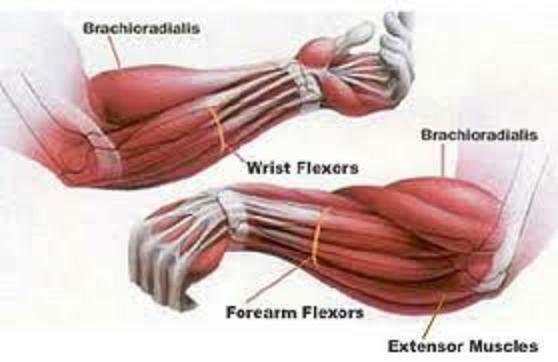 This is a great exercise for really stretching the forearm tendons simply by using rubber bands. Take a thick rubber band and wrap it around all your five fingers. Without causing too much pain straighten your elbow out as far as you can. 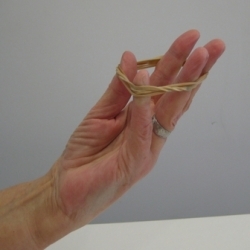 With the rubber band around your finger try to straighten and spread your fingers. Hold this position for 3-5 seconds and then relax. Try to do between 5-10 repetitions. For more resistance you could use two or three rubber bands. 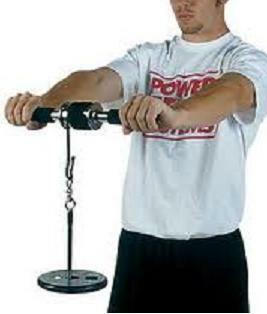 One of the most important parts of releasing forearm and elbow tension is to build up grip strength. The Ball Squeeze is great for helping improve grip strength and mobility. Get yourself a tennis ball or hard rubber ball. Grip the ball in the palm of your hand. Squeeze the ball until you can't any further. Hold the squeeze for 3-5 seconds. 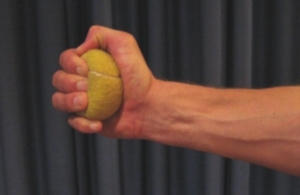 Release the squeeze until the ball retains it’s normal shape. Try and perform 5-10 repetitions. To go along with a good stretching program there should be some strength building exercises to build up the strength and endurance of the forearm muscles. 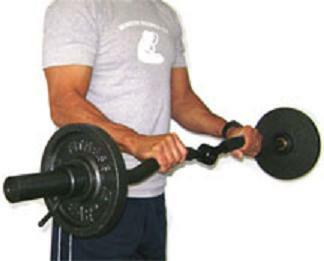 Strengthening the muscles of the forearm and upper arm will stabilize the elbow reducing stress on the tendons. Place your outstretched forearm with your palm facing up across a table. Curl your fingers up and lift your wrist up off the table. This exercise can be performed with a barbell, dumbbell, or resistance bands. Slowly lift upward to the count of five, then lower to the count of five. Repeat 10 times for three sets. Place your outstretched forearm with your palm facing down across a table. Curl your palm downward till you feel your forearm flex to the count of five, curl your wrist up and backwards till you can’t anymore for a count of five. This exercise can also be performed with a barbell, dumbbell, or resistance bands. Repeat 10 times for three sets. This exercise is not only great for building strength but also muscle endurance. Here is a great exercise that you can do at home or in the gym. All you need is about 4 or 5 feet of rope, a piece of pipe about 10 inches long and 2 inches wide and a weight attached at the end. You could also invest $10-$15 and buy a wrist roller from Walmart or a sporting good store. With your arms outstretched and wrist roller in hand begin to roll your wrist until the rope rolls up around the pipe. Once the rope has rolled up around the pipe roll the rope back down till the rope is fully outstretched again. Repeat several times. Set a goal to eventually do it ten times or more. The reverse grip negative curl not only helps develop and strengthen the forearms and biceps, by focusing on the negative portion of the movement you really force the muscles and tendons to perform under a content tension. The key to really make this exercise work well is to stretch the negative out to ten seconds or more. 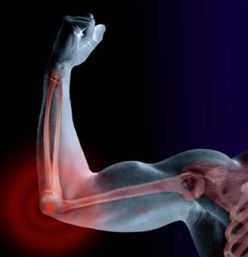 Elbow tendonitis is really painful and inhibiting for many people. It places a real strain on muscles and tendons near the elbow joint, causing a lack of strength, mobility, and sometimes a great deal of pain. The good news is there are ways to make things a lot better. By incorporating some good stretching and strength building exercises in your normal routine you could be back in the swing of things before you know it!